In a relatively short amount of time, smartphones have become our trusted daily companions, always by our side and ready to be pulled out with a moment's notice to help us communicate, help us answer a question, or to help us shop. According to a 2014 study by Bank of America, Americans rank their mobile phone higher in importance than television, coffee, and social networking sites, but luckily not as important as brushing their teeth, and 34% would give up chocolate for life instead of their smartphones. Now we know they're serious. 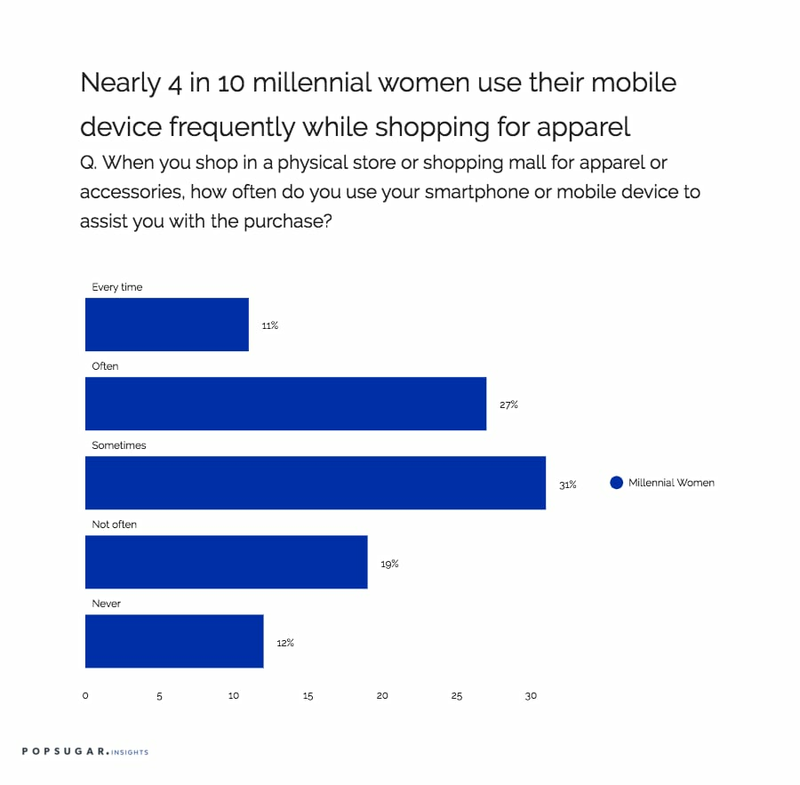 As part of the POPSUGAR Future of Retail Experiences study, we wanted to dive into the reliance on mobile devices to study the usage of smartphones in store when shopping for retail apparel, so we asked women to tell us how often they use their smartphone or mobile device in store, and what they're using it for. Overall, 58% of millennial women say they use their smartphone "often" or "sometimes" when they are in a physical store shopping for apparel and accessories, but only 11% say they use their phones every time they are shopping. Millennials, however, are 38% more likely than women 18-49 to use their phone every time, pointing to the fact that this is a growing trend and something that has the potential to grow in usefulness for shoppers. Millennial women are using their phone in store in order to perform a number of different types of shopping activities, including finding coupons (47%) and finding an item at a better price (40%), as well as more social behaviors such as taking a photo of a particular product and sending it to a friend or family member for their advice (32%), and taking a photo of a product they are considering for some future action (28%). Over one in four millennial women are using their phone to research a product review while standing in the store aisle, and 18% are using it to obtain detailed product information. Only 11% of millennial women are using their phone to purchase the item directly on their mobile device while in the store, but they are 38% more likely to do so than women 18-49.